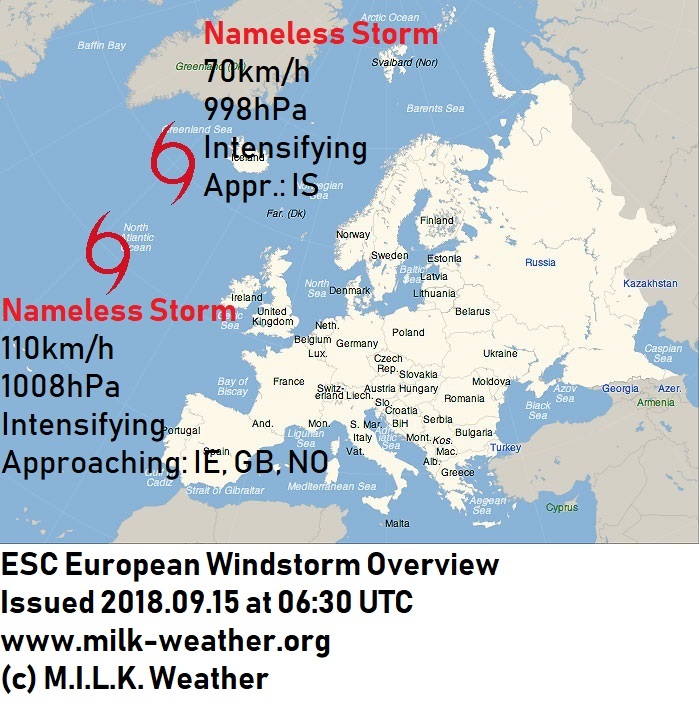 There are two storm systems currently in the vicinity of Europe. A weak storm has formed to the southwest of Iceland, currently holding wind speeds of just 70km/h and a central pressure of 998hPa. The storm is expected to slightly intensify as it approaches ICELAND as the day progresses. In about 12 hours, the first storm gusts may reach the island, and wind speeds will stay elevated, especially at exposed locations, for hours to come. The still unnamed storm located to the west of the British Isles has intensified over night, now holding wind speeds of around 110km/h and with its central pressure having dropped to 1008 hPa. The storm is expected to further intensify as it makes its way towards IRELAND and the UK. Wind speeds will start picking up at the western coast of Ireland this evening. Especially the western and northern coasts of Ireland will be affected; here, gusts up to or exceeding 110km/h are possible. Wind conditions will stay calmer further inland, but there may still be storm gusts. Storm warnings and watches have been issued accordingly (see below). The wind field of the storm will reach Scotland in the coming night; especially in the Scottish Highlands, the Isles and the coasts, partially hurricane-forced gusts are to be expected. Wind speeds may exceed 120km/h. As it is still unclear how far south the wind field will stretch, a storm watch has been issued for large parts of the UK. Between 36 and 48 hours from now, the storm field is expected to reach the coast of Norway, where gusts of around 100km/h are to be expected. Due to uncertainties in prediction, no forecasts are given for more than 48 hours in advance. 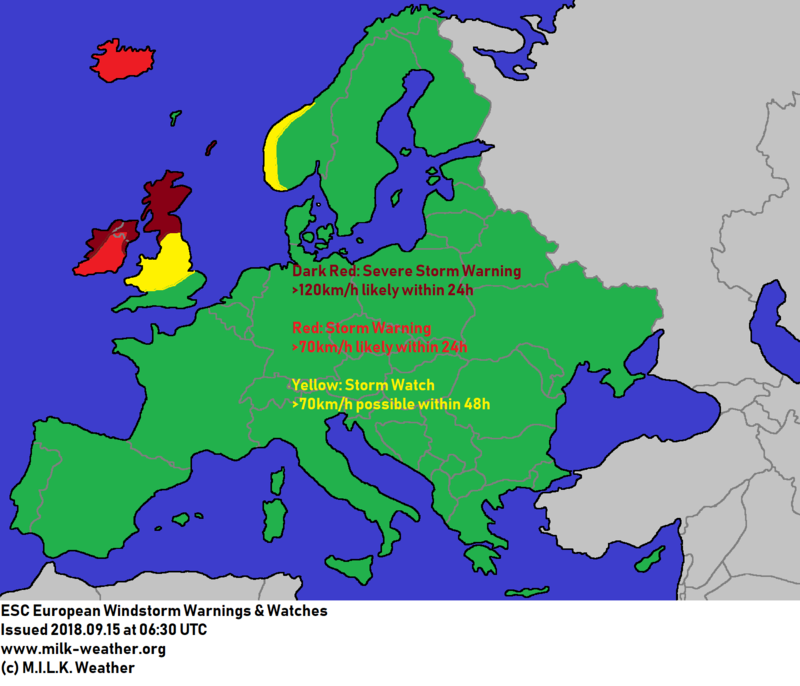 Below are the ESC European Windstorm Overview and Storm Warnings & Watches. This entry was posted in Uncategorized on September 15, 2018 by Linus Höller.